One World Network operates in the wight loss MLM niche. The company fails to provide a corporate address on their website. Heading up One World Network is founder and CEO, Eric Caprarese. Caprarese (right) first appeared on BehindMLM’s radar in 2013, as co-founder and CEO of Brain Abundance. Brain Abundance had fizzled out by 2016. Caprarese resurfaced as President and CEO of B-Epic later that same year. In our Brain Abundance and B-Epic prelaunch review, we noted both company’s distinct lack of retail focus. A reader asked up to revisit B-Epic in mid 2018, prompting publication of an updated review. Since our prelaunch review, B-Epic had deteriorated into a pay to play pyramid scheme. Retail sales were possible, but handled through separate websites that had little to no traffic to them. Thus it is believed the vast majority of B-Epic sales were by affiliates. Alexa traffic estimates for the B-Epic website show a sharp decline throughout 2019. That said the B-Epic website is still functional. Eric Caprarese is still cited as company President and CEO. Surprisingly, Russia is cited the top source of traffic to B-Epic’s website (30%). Whether One World Network was launched in response to or is responsible for the decline in B-Epic website traffic is unclear. Promotion of One World Network began in late September, 2018. B-Epic’s social media accounts were still live and updated as of March 22nd, 2019. Read on for a full review of the One World Network MLM opportunity. PerSu and SubDu are also available in a twin pack for $99.95. The One World Network compensation plan pays affiliates for selling products to retail customers. Residual commissions are paid via a binary team. A four-level deep matching bonus on downline residual commissions is also available. There are nine affiliate ranks within the One World Network compensation plan. PV stands for “Personal Volume” and is sales volume generated by sales to retail customers and an affiliate’s own orders (including autoship). GV stands for “Group Volume” and is PV generated by an affiliate and their downline (note that GV on only one side of the binary team is counted for rank qualification). One World Network affiliates are paid a 50% commission on sales volume generated by retail customer orders. When a newly recruited One World Network affiliate places their first product order, the affiliate who recruited them receives a 30% commission on sales volume generated by the order. Residual 10% recruitment commissions are also paid down two levels of recruitment (levels 2 and 3 of a unilevel team). Owner and higher ranked One World Network affiliates qualify for residual commissions. One World Network pays residual commissions via a binary compensation structure. Sales volume is generated across the binary team via retail sales and affiliate orders. At the end of each week One World Network tallies up new sales volume on both sides of the binary team. After residual commissions have been calculated for the week, paid on volume is flushed. Going into the following week, any leftover volume on the stronger binary side is carried over. One World Network pays a Matching Bonus on residual commissions earned by downline affiliates. The Matching Bonus is paid using the same unilevel team as recruitment commissions (see above). To qualify for MLM commissions, mandatory 40/70 PV autoship is required. The purchase of one Subdu or Persu pack counts as 40 PV. The 24 hour combined pack appears to generate 70 PV (based on provided Basic Builder Pack PV). To be perfectly honest I’m not really sure why One World Network exists. The company has two weight loss products, which could have easily integrated into B-Epic. The cynic in me want to believe Eric Caprarese just wanted to reboot B-Epic without formally rebooting it (hype launch and all that), but I digress. On the compensation plan side of things your first red flag is One World Network’s erroneous use of “preferred customer”. From a regulatory perspective, a preferred customer in MLM refers to a retail customer on autoship. One World Network however use the term to refer to new affiliates. In the past both Vemma and Herbalife argued affiliates on autoship who haven’t recruited are preferred customers. The FTC rejected the argument from both companies. To be clear: One World Network’s “preferred customers” are affiliates. One World Network follows Brain Abundance and B-Epic, in that it’s pretty clear the majority of company revenue will be derived from affiliate autoship. Forcing affiliates to purchase products to qualify for commissions is an MLM regulatory no-no. One World Network ignores that and forces affiliates onto minimum 40/70 PV autoship from the moment they sign up. With commissions paid out on the recruitment of new affiliates, it follows that the primary focus of One World Network affiliates is affiliate autoship recruitment. That is you sign up as an affiliate, start an autoship order and then recruit others who do the same to qualify for commissions – on their autoship orders. Retail is possible but not required or encouraged anywhere in One World Network’s compensation plan. Considering this has been an ongoing problem in Caprarese’s companies since Brain Abundance, why would it? If you’re still on the fence you should be able to confirm a lack of retail activity by asking your potential upline how many retail customer orders they have each month (ask for data on a few months), versus recruited affiliates on autoship. You want to see sales volume tipped in favor or retail customer orders, which I’d be very surprised you’d find. There might be one or two One World Network affiliates focused on retail, but the vast majority are likely to be engaged in affiliate autoship recruitment. This would of course make One World Network a pyramid scheme. As with all pyramid schemes, once recruitment slows down so too do commissions. 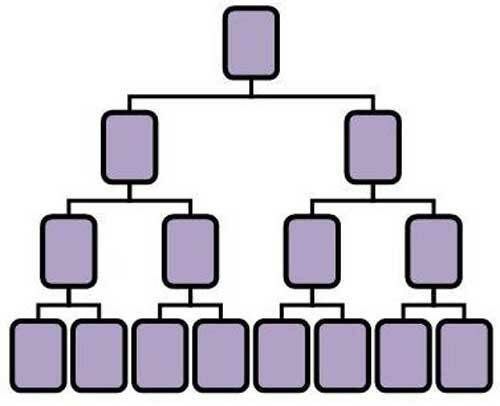 The math behind pyramid schemes also guarantees that the majority of participants lose money. One final thought, weight loss is great and all but it’s typically a temporary goal. Once achieved, supplements are not a substitute for good nutrition and exercise. With that in mind I find the long-term appeal (repeat order) viability of One World Network’s products to be low. I noted there’s a “Tune” product affiliates can order when they sign up. Tune is marketed as a “daily detox formula”. I don’t profess to be a doctor but I have to wonder what people are doing to their bodies if they truly need a daily detox. Maybe there are bigger lifestyle issues at play that need to be addressed? Just a thought. At the time of publication One World Network is marketing Tune to affiliates, with an order “automatically Create A Monthly Subscription For This Item”. Trouble is that Tune hasn’t been released yet. Collecting monthly fees for a product that’s not being shipped and paying commissions on generated sales volume? Really puts the business opportunity focus of One World Network into perspective hey.